Seattle Secret Music began as a realization—that much of the music that actually intrigues and inspires young musicians (as well as the rest of us) occurs in unexpected places, played by relatively unknown but passionate players, and is not recorded. Seattle is full of examples: whether it's a busker in the Pike Place Market or a day at Folklife, fresh music often delights and amazes, and we usually don't even know who made it. This observation has grown into a series of musical benefit events, celebrating such essential working talent as well as supporting worthy local causes. Hopefully we will also inspire individuals in our audience to bring a little more real live music into their everyday worlds. Since 2004, Seattle Secret Music Showcase benefit concerts have been held at the Triple Door Theater in downtown Seattle. We have presented Jim Page, Orville Johnson and Mark Graham (aka The Kings of Mongrel Folk), Tingstad and Rumble, Jo Miller and the Burly Roughnecks, Charlie Murphy, Rouge, Rebel Voices, Kate Borkowski, the Gina Salá Ensemble, Pat Wright and the Total Experience Gospel Choir, Josephine Howell, Ricardo with the Dogmanauts and Valerie Rosa, among others. Proceeds from each show go to a selected cause: #1, #2 and #3 helped out the medical services for the city's homeless youth at both the Pike Market Clinic and the 45th Street Clinic (www.PSNHC.org), #4 gave to the Sightline Institute (www.sightline.org), #5, #6 and #8 supported the Voices in Wartime/Soldier's Heart educational project (www.voiceseducation.org). Showcase #7 & #9 were both benefits for the Power of Hope, an organization which facilitates youth empowerment through the arts. You can learn more about the Power of Hope at www.powerofhope.org. Showcase #10 was on April 1st, 2010, featuring electric cellist Jami Sieber (www.jamisieber.com) and benefitting the Music Project Foundation (www.musicprojectfoundation.org). Showcase #11 was on May 19, 2011, and featured Gina Salá with her ensemble, with some hot pickin' from Coutry Dave Harmonson and the Pickin Crew to start things off, and benefitting the MAY Foundation (www.MusicAcademicsYouth.org). Showcase 12 was on May 17, 2012, and featured the Port Townsend Acoustic Blues Festival (which was also the beneficiary of the concert). The show artists included Daryl Davis with Kitty King and Sonia Lee, Orville Johnson with John Miller and Grant Dermody, Son Jack Jr. and Michael Wilde with Jim DiIanni, Mary Flower, and Ricardo and friends. 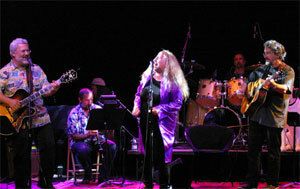 Showcase 13 was on May 9, 2013, and benefitted the Port Townsend Acoustic Blues Festival. The show artists included Daryl Davis, John Miller and Orville Johnson, Ricardo & Friends, Ben Hunter and Joe Seamons, Lauren Sheehan and Jon Parry, Arthur Migliazza, Del Rey, and Caitlin Romtvedt. Showcase 14 was on May 22, 2014, and benefitted the Port Townsend Acoustic Blues Program. The show artists included Alice Stuart, Ricardo & Friends (Orville Johnson, Garey Shelton, Brooke Lizotte), Orville Johnson, Blueridge Boy Eric Freeman, Jelly Rollers (Darren Loucas and Sean Divine), Jon Parry and Daddy Treetops. Showcase 15 was held on May 21, 2015, and benefitted the Port Townsend Acoustic Blues Program. The show artists included Cyd Smith, "Norf Cackalack" - Gary Lilley and the Winsell Brothers, Orville Johnson with Mark Graham "The Kings of Mongrel Folk", Ricardo with Brooke Lizotte, Steve James, Terry Robb. Showcase 16 was held on May 26th, 2016, and benefitted the Port Townsend Acoustic Blues Program. The show artists included Matt Munisteri, Julian Smedley, Matt Weiner, Casey MacGill; The Red Water Trio & Friends – Jesse Snyder, Brian McCree, Joe Garguilo, Orville Johnson, Brooke Lizotte & Richard Russell; Mason Turner & Isaac Hollandsworth and others. The next Showcase details are being discovered, check the Showcase page for details. You can find links to many of the artists on our Musicians page.